2 meters for use with olive oil. Including instructions. 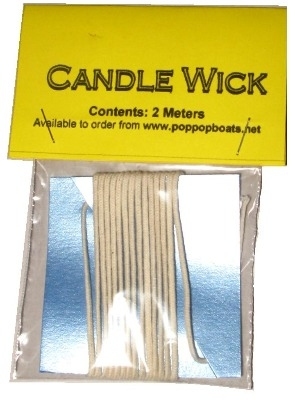 2 meters of candle wick. Using Olive Oil with candle wick. (Instructions are also printed on the packet label). Cut approximately 20mm (3/4 inch) of candle wick. Dip the end of the wick to be lighted into the oil to coat. (Prevents the wick from burning out). Slide the fuel holder and lighted wick into the boat under the boiler. If you are using olive oil, make sure the wick is not too short or too long. The proper length of the wick should be about 5 mm above the oil. Olive oil and other fuels. Other types of fuels either do not work well or will over heat the boiler causing damage to it. Olive oil burns cooler in comparison to other cooking oils - vegetable oils, and reduces the risk of overheating the boiler.